Did you ever think you would hear a quilter or sewist say those words? 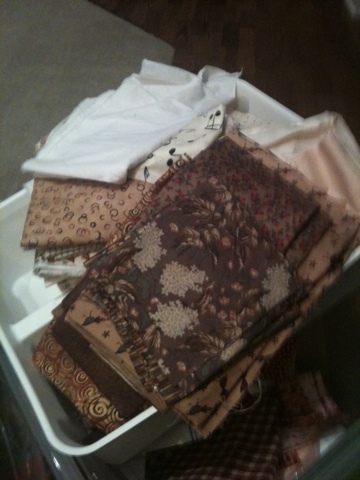 I am trying to reorganize my fabric and realized I have some really ugly fabric from the early days of my quilting life. So here's the question...what do you do with fabric that your tastes have outgrown? This is my first time using the blogger app on my iPhone. You could have a giveaway. As "they" say: "one person's junk is another person's treasure. A lot of quilters have been "down-sizing". Some offer "lots" fabric at a certain price, first email gets it. Some have been listing extra fabric in the etsy shops; and some are having give away's. Do you have a charity that makes quilts for less fortunate people or the local children's hospital? They would probably welcome it! Have you seen the posts about quilts that people are making with their "uglies"? I am going to sort all my storage on the weekend and KNOW I have some horrors lurking! Hilachas took the words right off my keyboard! I have UGLY fabric as well. I'll be happy to donate mine. Gives me more room in my plastic shoeboxs for fabric that I love! I think it was on Bonnie Hunter's Quiltville blog that I read a saying, something along the lines of if the fabric still looks ugly, you just haven't cut it small enough! Hav a giveaway like Susan did (Canadian abroad). Karen at Listen to the birds sing want some blocks making to take to Thailand. Is anything suitable for that? Hi Di, I have some things from about twenty years ago that are so pug ugly I can't believe I could ever have thought I would need them in my stash. Must have had a moment of complete madness! I'm not a quilter but my first thought was giveaway - your tastes may have changed, but someone else may love the fabrics! Like the others - have a giveaway, or put them in kits, price them and see if someone will buy them. There are new quilters like me out here in bloggy land that are entering giveaways left and right so I can get fabrics in order to "practice" my quilting techniques and not ruin fabrics I've paid dearly for. Fabric isn't cheap, and mailing isn't cheap either (so you might want to say the recipient has to pay the mailing costs). But like I say, there are plenty of wannabe quilters (to quote Madame Samm) and new quilters (like me) that are just starting out and after buying the basics (sewing machine, self-healing mat, rotary cutters, acrylic rulers, pins, etc), the fabric and thread are agonized over. I never knew I was getting involved in such an expensive endeavor. YIKES! I did an ugly fabric giveaway. Twice! It is amazing what people like that you think is hideous. It all went, some to charity blocks and lots to quilters with better/different vision than me. I felt good to have it out the stash because I was NEVER going to use it and they felt good because it was a giveaway. Too much fabric, too much fabric... no, sorry, does not compute ;o) Seriously though, maybe a local school could make use of it?